According to OSHA, the purpose of the Hazard Communication Standard (HCS) is “to ensure that the hazards of all chemicals produced or imported are evaluated and details regarding their hazards are transmitted to employers and employees." The premise behind HCS is that employers and employees have the right to know the hazards and identities of the chemicals they are exposed to and what precautions they can take to protect themselves. OSHA's phase-in period ended on June 1, 2016 for aligning its Hazard Communication Standard (HazCom) with the Globally Harmonized System (GHS), a global hazard communication system developed by the UN that standardizes the way hazardous chemicals are classified and then communicated via safety data sheets and labels. With GHS alignment, the classification of chemicals includes categorizing hazards based on severity, a concept that didn't exist in HazCom 1994. It also means significant changes to safety data sheets and labels. Labels now have six standardized elements: product identifier, manufacturer information, signal word, pictograms, hazard statements and precautionary statements. Also under GHS, material safety data sheets (MSDSs) are referred to as safety data sheets (SDSs), the 'M' has been dropped. More importantly, these SDSs must now contain 16 sections in a specific order. Because of these changes, employers should expect to receive updated labels and SDSs with inbound shipments of chemicals, resulting in the eventual turnover of their entire safety data sheet library. Learn more about the HCS revision by visiting our GHS Answer Center. See what actions GHS alignment requires for SDSs, workplace labels, training and more by downloading our GHS / HCS Compliance Checklist and SDS Sample. And if you are looking for an MSDS or a newly formatted GHS SDS, try our SDS/MSDS Search tool. HCS violations consistently rank in the top 3 of OSHA’s ten most frequently cited standards list, with citations issued in nearly all industries. 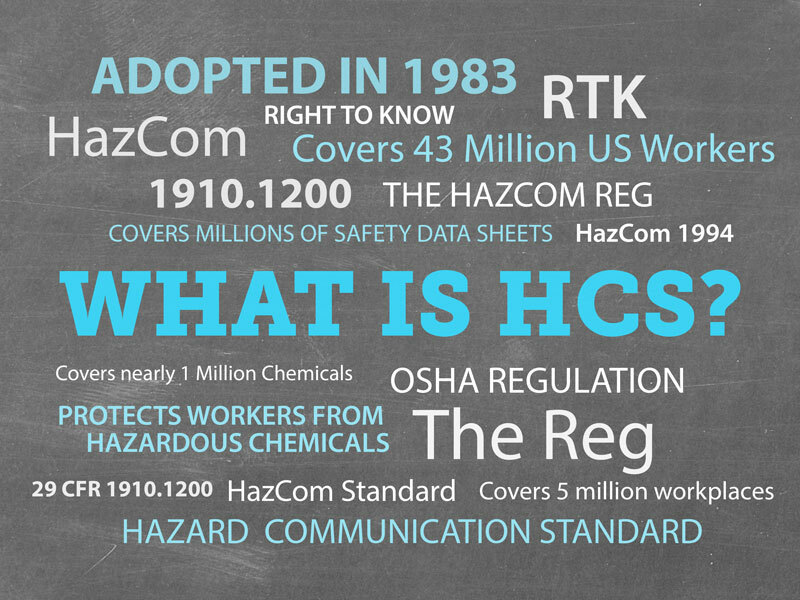 Nearly everyone involved in the manufacture, transport, distribution, and use of hazardous chemicals has at least some responsibilities under HCS / HazCom. Chemical Manufacturers need to evaluate and classify the chemicals and any components of chemical products they produce to identify potential hazards, and then must create and distribute appropriate warning labels and safety data sheets (SDSs) along with their product shipments to importers, distributors or end-users. Importers and Distributors must also supply labels and SDSs / MSDSs along with any hazardous chemicals they ship to end-users. If, for whatever reason, they are not able to secure an SDS / MSDS from the chemical manufacturer, then the responsibility is theirs to create and transmit all necessary labels and SDSs / MSDSs. For an expanded discussion of the five key components of employer responsibilities, read the Safety Manager To-Do List under the next tab. Written Plan – You must have a written plan for your HCS / HazCom program. This plan should be reflective of your workplace and the hazards that your employees face in their day-to-day work environment. It must describe how your facility meets the requirements for labeling, SDS / MSDS management and training. Keep in mind, the written plan is likely the first thing an OSHA inspector will ask for, so it should be readily accessible. For help with your Written Plan, download our Written HazCom Plan template. Chemical Inventory – The written plan needs to include a current list of all hazardous chemicals. A properly maintained SDS / MSDS library can be used to quickly create a chemical inventory. A good electronic chemical management solution, provides the benefit of not only making it possible to quickly print out a list of chemicals in the workplace, but can also track where those chemicals are located and it what quantities. Labels & Warnings – All of the chemicals listed in your inventory must be labeled properly and appropriate hazard warnings must be posted in your work areas. Make sure that products shipped into your facility have labels that are legible and prominently displayed. Also, if you re-bottle or re-drum hazardous chemicals at your facility, it is critical that you have a good secondary label system to ensure the chemicals are properly identified. Note: Manufacturer shipped label requirements under the GHS-aligned HaCom Standard are substantially different from the pre-GHS requirements. With GHS adoption, shipped labels have six prescribed, standardized elements: a product identifier, the supplier identifier, a signal word, pictograms, hazard statements, and precautionary statements. Safety Data Sheets (SDSs) – Think of SDSs as industrial-strength safety labels telling you everything from the hazards associated with a chemical and how to handle and store the chemical, to the proper personal protective equipment to use when handling the chemical. You must have SDSs for all the chemicals in your inventory. You must make the SDSs readily accessible to your employees. And your employees must be trained on where to find and how to read SDSs so they fully understand the risks associated with the chemicals and the protection they need to use when handling the chemicals in the workplace. Note: Under GHS, MSDSs are referred to as safety data sheets (SDSs) and have a 16-part format, in a fixed order. OSHA's alignment of HazCom / HCS with the United Nations' GHS necessitated the revision of all MSDSs to the new SDS format, affecting the makeup of employers' document libraries, which, even now that the GHS deadlines have past, may still contain a mix of both document types. Training – The HCS requires that you train your employees on hazardous chemicals and where to find your written plan and SDSs / MSDSs. And, more importantly, on how to read and understand the SDSs / MSDSs, and corresponding container labels -- both the shipped and workplace/secondary labels. Make sure employees are trained before assigning them to work with hazardous chemicals. Note: HCS alignment with GHS required additional training for all employees covered under HCS -- Effective December 1, 2013 employers are required to ensure employees are trained on the new GHS-aligned SDS and manufacturer shipped label formats. Call Us Now: 1.888.362.2007 . One of our experts will help you create a solution to meet your compliance needs. Outside the U.S., dial 1.312.881.2000 .